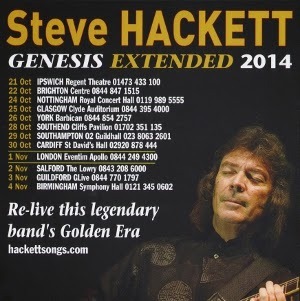 It might seem strange to say it but Steve Hackett plays Genesis a lot better than Genesis played Genesis in their prime! Hackett and friends, Roger King on keys, Nick Beggs on bass, Gary O’Toole- drums and percussion, Rob Townshend on sax and flutes and Nad Sylvan on vocals, played nearly 2 and a half hours of complex and powerful Genesis material and not only were they ‘on it’ from the first notes of Dance on a Volcano but the capacity crowd were totally with and behind the band. This was a rather special performance by a band who have complete faith in each other and in Hackett and who take the music of Genesis to places that the original band dared not tread. Every number is a classic of the genre but the performance avoided the longwinded widdling that characterised Tony Banks performances and while they weren’t exactly ‘Ramones do Genesis’ the performances of numbers such as Return of the Giant Hogweed or I Know What I Like (In Your Wardrobe) became tight and powerful rather than the flabby and overblown spectacles of yore. Individual performances were superb with especial mention for Nick Beggs' 5 string bass and Bass Stick playing as well as O’Toole’s drumming and percussion and while Steve Hackett is not the most dynamic frontman Nad Sylvan gave the look of the band focus and some theatricality along with a brilliant vocal exposition. Hackett’s guitar playing, as ever, was peerless, sticking almost entirely to his Fernandes throughout and ripping out the most complicated and intricate solos without missing a beat. Of course there were the Genesis standards including Supper’s Ready and Firth of Fifth but he also added some lesser heard numbers like Horizons and The Knife. One of the best sounding shows I’ve heard this year and refreshing for lack of shocks or effects. Prog is as modern as ever and Steve Hackett definitely one of its masterplayers.